Announcing the release of the BagShare’s fantastic, new comprehensive how-to video. Learn how to made BagShare Seed, Feed and Malt Bag Initiative bags in 2 minutes or less, from materials diverted from the waste stream. Audible Café recently published an interview they conducted with us in December of 2017. Podcaster Judy Eddy braved the cold to talk with us for a long time at the Old Stone Mill, just as Phase 1 renovations were getting underway. Things are shaping up at the Old Stone Mill with first floor renovations well underway. Electricity and plumbing are being installed and the bathrooms, office space, sewing center and machine shop walls are framed and being finished. Mike and Leni have been trying out some homemade solar thermal panels after Rose let them know about experiments that Bruce from Berkshire Environmental Action Team tried. We’re looking into a temperature monitoring system to test out different designs. With so much sunlight pouring in to the south-southwest wall, it’s just begging for experimentation! More announcements to come soon about more community collaborations and re-use efforts, including supplying discontinued linens to shelters in the region. Also under development is the other clean energy heating strategy – compost heating system. We’re working with the folks at Agrilab, who usually helps farms with cow-power systems. This will be a rare system on a site that DOESN’T generate manure and waste. Stay tuned! Phase 1 of the Old Stone Mill Center is now in the final stretch of the planning stage – getting set to start renovations this spring. To get our onsite programs going as soon as possible, we’re starting with the core essentials for renovation – restrooms, a utility sink, refrigerator/ counter area, and the fabrication shop on the first floor, a utility space in the basement and the stairwells. The central area with plumbing will have a lower, more conventional ceiling height to maximize for efficient heating. This also allows for a storage loft above. There will be a 300 sq. ft space to serve as an office and also an experimental small space to see if bio mass heat from a compost mound can extend our season. This first heating experiment will be labor based free workshop to construct the mound using fall mulch, manure and soil, most commonly known as a “Pain Mound” (Named after inventor Jean Pain – learn more. ) Get in touch if you want to help. Hot water from the sun…REALLY? We strive to work with local solar companies/ and community collaborators so our hot water can be generated by solar thermal collectors. The mill is a center for renewable energy experiments, an opportunity ground for testing. Learn to assemble a solar collector in celebration of a state-wide push for 100% renewable energy. If you are a company that provides what we need and you want to use the mill to showcase your project and encourage refurbishing a large space sustainably, JOIN US! Or if you are a student or political group and want to do a hands on build. …Help us ‘workshop this!” Get in touch. Our current idea for low impact heating and cooling for the central area is high-efficiency electric heat pumps. This is a clean and efficient heating method using air-exchange. Because of it’s high efficiency, it is often combined with solar-generated electricity (photovoltaics), another option for the mill to consider. On-site photovoltaics may not be feasible, but, purchasing electricity through a green-offset option from the utility company or from off-site solar-farm micro grid cooperative could work. We are open to your ideas. Living in New England as we do and working to transition to 100% renewables is a worthy challenge. The first floor of the mill is 7000 sq. feet. How do we heat it: with a “season extender” like bio-mass / heat exchange compost mound or a passive solar Trombe wall? How long will that last? We’re looking to experiment with these low-tech / high efficiency / non-fossil-fuels sources. We have been going full speed ahead with our off site programming. Accomplishments to date/ Offsite programming. • Bagshare workshop at Council on Aging. 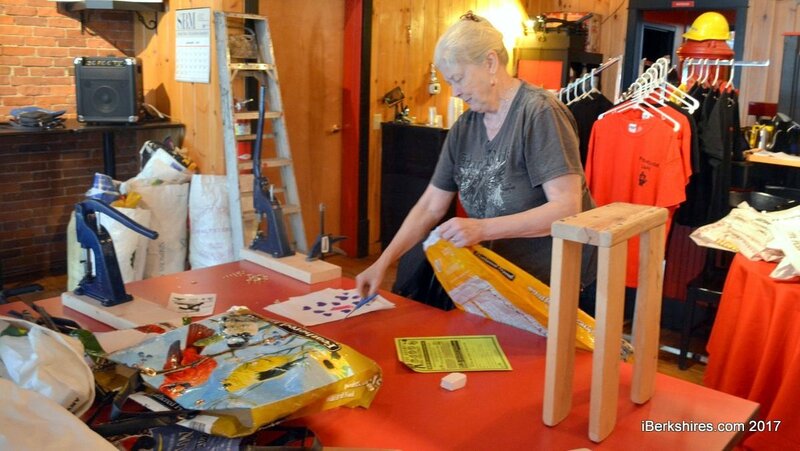 • Plastic bag ban introduced in Adams referencing that The Old Stone Mill will make bags for anyone who doesn’t have a bag. Plastic bag ban passed. • Met with Aladco Linens in Adams. Agreed to take ALL of their linen castoffs (previously landfilled). Over 3,500 lbs of clean linens diverted from the waste stream and stored at the mill. • Videos on Hands on Learning at Youth Center Inc.
Mike Augspurger and Leni Fried of the Old Stone Mill Center work with the Youth Center Inc. every week to let kids explore using tools, learning what things are made of, experimenting with bicycles and exploring the feeling of physics through play. • Partnering with Goodwill Donation Center, Salvation Army and Current Art Place partner Dept of Solid Works. Working with ArtPlace partners, Tony Mazzucco , Town administrator and The Adams Arts Advisory Board to build awareness of March 30 , plastic bag ban. 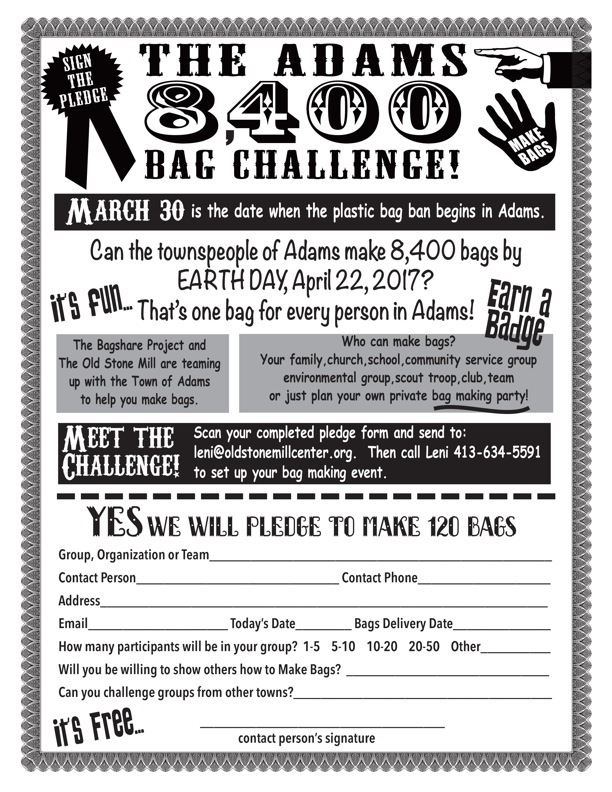 The Bagshare Project/ Old Stone Mill Center introduces the 8,400 bag challenge = one bag for every person in Adams. 25 groups pledging 120 bags each signed up so far, diverting what would be equivalent to 99,000 grocery bags from landfill, Replacing them with 3000 ‘bags for life’. • Partnering with the Charity Center in Adams for linen distribution/bike program. … More to come. Keep checking in. Skills through exploration with Youth Center, Inc.